I mentioned in a recent post that I’d be attending the Word of Mouth Marketing Association (WOMMA) Summit next week in Las Vegas. The WOMMA Summit being held next week in Las Vegas will feature social media experts and word of mouth marketing practitioners from some of the leading brands and organizations around the world. I’ll also be speaking on the topic of “Organizing For Social Business,” and IBM’s Carolyn Baird will be sharing detailed results from IBM’s recent Chief Marketing Officer study. The general theme of my session will center around the challenges and opportunities larger organizations face as they go about building their social strategies, sharing particular insights and experiences we’ve had inside IBM over the past number of years on this front. At IBM, our social business strategy has very much centered around one of our best market-facing emissaries, the IBMer! If you’ve kept pace with any of our marketing initiatives in recent times, you know that the IBMer is front and center in those communications, most notably in our TV advertising, but also extensively in the digital and social media as well. But their participation doesn’t end there. We’ve featured subject matter experts extensively across a wide range of topics and across a range of venues in the digital and social media space, as well as in other public and sometimes private venues (think conferences, events, customer meetings, etc.). As I’ll note in my talk, this direction is very much in keeping with IBM’s high-touch sales heritage, but builds on that legacy by making our people more accessible via social venues as well. That said, don’t think encouraging very busy professionals to participate in social venues doesn’t come without some challenges — organizational, economical, cultural — all of which are an integral part of the story that I also look forward to sharing with my fellow attendees in Las Vegas. Speaking of which, another fellow IBMer, Carolyn Baird, is also going to be presenting at WOMMA. Carolyn will be sharing insights from IBM’s global Chief Marketing Officer (CMO) study, one of the largest ever conducted of CMOs worldwide. The study revealed that CMOs are under enormous pressure to manage a much broader range of responsibilities than ever before, and that underpinning this evolution is a growing dependency on technology that is reshaping CMOs’ strategies and priorities. Carolyn’s session will share how CMOs are managing these shifts and the impact all of this is having on the CMO-CIO relationship (Carolyn’s session takes place Tuesday, Nov. 13th, from 11:45AM-12:30 PM). Though I’m certainly excited to sharing IBM’s social story at such a distinguished convocation, I’m even more excited about hearing from my fellow social media enthusiasts. 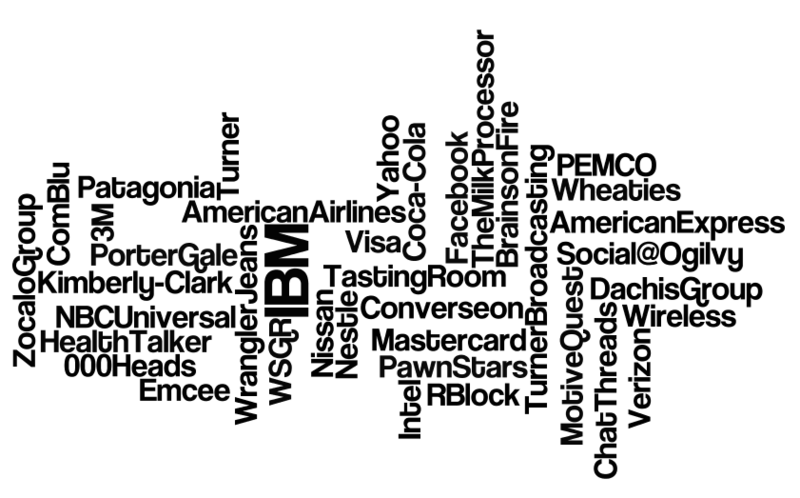 I took the names of all the organizations expected to be presenting at WOMMA, and you can see the vast breadth and diversity of companies and organizations represented in the Wordle cloud above. To follow the tidings on Twitter from the Summit, use the hashtag #WOMMASummit. For my session, I’ll ask that folks use the hashtag #WOMMAturbo. Texas has never finished below second place since CNBC started the study in 2007. On the downside, Texas came in 26th in “Education” and 35th of “Quality of Life,” apparently getting dinged for less available health care and higher property and sales taxes. Obviously, this is very exciting news here in Austin and across the state of Texas, especially considering the vast diversification we’ve seen of the Texas economy over the past decade. When I was growing up in Texas, energy and oil dominated the economy, but we’ve seen massive investments and innovations in more diverse fields these past 20 years, including high tech, telecommunications, biotechnology and life sciences, health care, and many more, all in a business-friendly (read: less regulation and taxes) climate. But we’ve still got some work to do, I would submit. If you’re a person of little means, whatever else you do, don’t get sick here. Texas is not expected to expand Medicaid or establish a health insurance exchange, according to another recent announcement by Governor Perry, and only 31 percent of physicians in Texas accepted Medicaid patients in 2011, according to the Texas Medical Association and as reported in the Texas Tribune. So, congrats to the great state of Texas…I’m really glad to hear we’re doing a great job of taking care of business…but clearly there’s some work yet to be done in taking better care of our people! Impressions From SXSW Interactive 2012: Q&A With Mark McKinnon, Political Innovator…and The Most Interesting Man in the World! When I realized I had a way to reach out to and speak with Austin’s-own “political innovator” Mark McKinnon, a former Bush media strategist and longtime political maverick, at SXSW Interactive 2012 I seized the opportunity. Mark has been a familiar part of the American political landscape for several decades, having worked for causes, companies, and candidates ranging from 2008 Republican presidential candidate Senator John McCain, late former Texas Governor Ann Richards, Congressman Charlie Wilson, Lance Armstrong, Bono, and many others. We spoke with Mark about a number of topics, not the least of which included his experiences working with Congressman Charlie Wilson, the role of social media in politics, and the opportunity Americans Elect has to alter the U.S. presidential election landscape. Scott’s interviewed David Meerman Scott several times for developerWorks, but never on camera. That changed at SXSW Interactive 2012. If you’re not familiar with Scott’s work, you’re missing out on one of the early voices analyzing and detailing the opportunity presented by social media. From The New Rules of Marketing & PR to his latest book, Newsjacking, David Meerman Scott has been a consistent and practical voice in helping organizations large and small, as well as individuals, navigate the contours of the new and social media. He talks about all that, and the marketing lessons he learned from the Grateful Dead, in our extended interview below.